This was our first cruise. 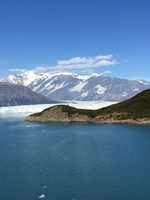 We chose the Amsterdam specifically for its smaller size and itinerary that included Hubbard Glacier. We loved the presentations by Kelly who shared about wildlife, points of interest and historical significance. She came across as smart and witty. We also really enjoyed the entertainment. I’m still humming songs that Don the piano guy chose. Seats in the piano bar were prime real estate when he was singing oldies, Neil Diamond hits, and rock n roll tunes. We were super impressed with a BBC wildlife film set to live music on the main stage. Magical. We went to one gala night, of two, in the main dining room and found the food and service less than spectacular, so most of our meals were taken at the Lido Market. Hubby loved the pasta station where you chose the sauce, veggies and meats that were cooked right there. There was steak on the daily menu and delicious desserts that tickled my palate. My favorite lunch spot was the Dive-In for juicy, delicious, charred to perfection burgers. 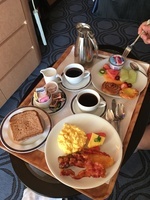 Breakfast was nearly always served to us via room service. We alternated between fresh fruit and yogurt or perfectly cooked scrambled eggs, bacon, sausage and toast. Coffee was hot and strong! Speaking of rooms, we had a veranda suite. The stewards, Bagus and Yoga, tended to our every need—including finding duct tape to patch one of our aged suitcases. The young men were cheerful and attentive. In port, we did a couple excursions. One was booked through the ship and the other through the travel company we booked with via United Airlines. Both were memorable and offered us great subjects for photographs. We did a whale watch in Juneau on a smaller vessel—17 passengers. In Sitka, we went to the raptor center, saw salmon spawning in a stream, visited a park with totems and local carvers, then a native dance performance—all on one excursion. Amelia, our guide, was knowledgeable and witty. We felt that both excursions were money well spent. So, embarkation and debarkation seemed daunting before we went through it. We found it super efficient and organized. No lines. Lots of helpful, cheerful people to show us the way. We used the port porter service in Seattle that allowed us to check in for our United flight onboard and handled our baggage all the way to Colorado Springs, our final destination. No charge! (At this writing, we haven’t gotten to Colorado Springs yet, so I can’t report on whether our luggage will actually get there, so I’ll update once we know the final outcome. The Amsterdam is a beautiful ship. There were lots of different kinds of “public” spaces to enjoy our time at sea. We’d grab a coffee at the Explorer Cafe and spend quiet time nearby where folks were reading, playing games or completing puzzles. The Crow’s Nest offered spectacular views and a bit more energy than the coffee spot. 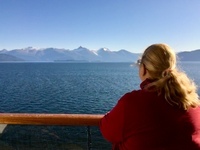 We viewed the approach to Hubbard Glacier from there with Kelly narrating. 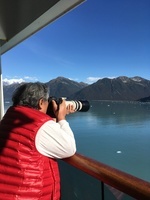 We chose to take pictures from our stateroom balcony once we got there. The captain positioned the ship so each side, port and starboard, had significant viewing time. I still can’t believe how close we got. 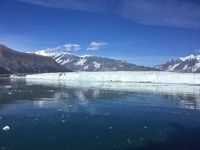 The whole Hubbard Glacier event was surreal, unlike anything we’ve ever experienced. So, we loved our cruise. We actually started planning our next cruise before the first was done. Cabin balcony was great for photos. 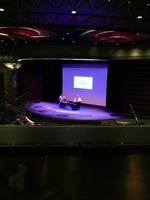 Talk with the Captain presentation with a behind-the-scenes slideshow. 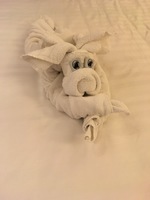 Fabulous stateroom stewards and the daily towel art. 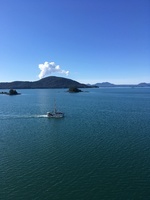 Awe-inspiring Alaska from our balcony. The cabin felt spacious. The bed was comfortable with good linens. There was a couch, coffee table, desk area, 4 narrow closet spaces, 2 lounge chairs with foot rests on the balcony and a tiny side table. The bathroom had only a glass shower stall—roomy. We did not want a tub. The shower head was a hand held rain shower with several adjustment options. Water pressure could have been stronger. Loads of hot water. It took me two days and an intervention from hubby to figure out how to use the fancy shower. 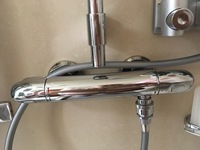 The right handle turns on the water & adjusts the pressure, and the left adjusts the hot and cold temperature. Without my glasses I couldn’t see enough to figure it out. Duh. Body wash, shampoo and conditioner were in receptacles on the shower wall. We used our own. Room was clean. Lots of drawer space. Hubby says the tv had a lot of RF interference. We had it on mostly to hear announcements on a dedicated channel or follow the ship’s course. Small boat. 17 passengers. Saw several whales. Good photo opportunities without big crowds. Amelia, guide, was smart and witty. She made sure accommodations were made for those who had trouble walking. Saw salmon spawning, totems, eagles and owls at the raptor center, and tribal dancing by a small group. Interesting. Nice bus. Big group.